Typesafe is a modern software platform that makes it easy for developers to build scalable software applications. It combines the Scala programming language, Akka middleware, and robust developer tools in a simple package that integrates seamlessly with existing Java infrastructure. Scala and Akka are deployed in production at some of the largest web properties and financial institutions in the world, and run on the battle-tested Java runtime environment. Deploy with confidence. 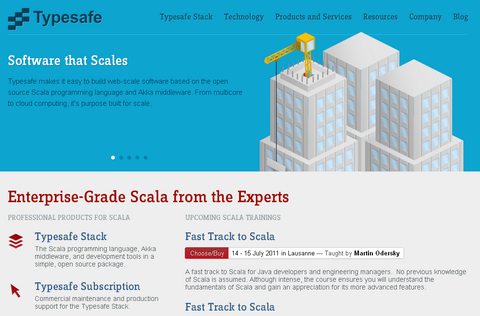 The Typesafe Stack is 100% open source, integrated distribution offering Scala, Akka, sbt, and the Scala plugin for Eclipse. And it is available for Mac OS X, Linux, and Windows and requires the Java runtime version 1.6 or later.